world premiere at 1st Stage in Tysons, VA.
For years, I've been thinking about continuing the journeys of some of the characters in my play Heads. This year, I finally had the chance when the new artistic director at 1st Stage in Tysons, Virginia, Alex Levy contacted me about premiering a play at his theater for the Womens Voices Theater Festival. 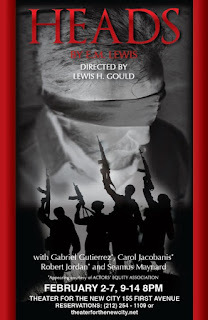 Samantha Macher with DC Metro Theater Arts said in her review, "Visceral, haunting, and beautifully executed, Now Comes the Night at 1st Stage is an excruciating and suspenseful look at lives of three journalists whose lives were ripped apart while covering the Iraq War. This world premiere play penned by Primus Prize winner EM Lewis, as a sequel to her award-winning work “Heads,”stands alone as an explosive examination of an endless and seemingly “bloodless” war and the role of the media in its portrayal. The show is a part of the incredible efforts of the Women’s Voices Theater Festival which seeks to highlight the scope of new plays being written by women, and the range of professional theater being produced in the nation’s capital." She continues, "...at its heart, this is a play about the power of friendship. In every scene, the expressions of these character’s affections for one another is palpable. Each tries to get the other to overcome their demons, speak their truths, and finally feel safe after being in unspeakable peril. Through the piece, the characters are forced to grow, to change, and to be honest about the choices and shortcomings that brought them to the place they were today-- in the aftermath of a truly explosive television interview. 1st Stage Theater, and Director Alex Levy, maintained Lewis’ masterful levels of suspense through a winning combination of deft design and stunning performances. Jaysen Wright, Dylan Morrison Myers, Alex Levy, Sun King Davis, and EM Lewis. Big thanks to Alex, who was a joy to work with as I wrestled with this story, and who directed the heck out of it. Thanks also to our fabulous cast -- Dylan Morrison Myers, Jaysen Wright, and Sun King Davis -- and our designers and crew, and the producers of the Womens Voices Theater Festival! (Also, major thanks to Deborah Kahn and Harris Miller for hosting me while I was working on the play!) I'm looking forward to completing my Iraq War trilogy in the next year or two. The year started with Moving Arts' production of The Gun Show in Los Angeles extending its fall production (directed by Darin Anthony; starring Chuma Gault) into the new year. Deborah Klugman, with the LA Weekly, said "The drama’s life-changing moments evoke a here-and-now immediacy, not easily forgotten." They took that production to Glendale College for a special performance -- thank you to producer Cece Tio, and Glendale College host Jeanette Farr-Harkins! Chuma was nominated for an Ovation Award for Best Solo Performer. at Passage Theater in Trenton, NJ. I spent several weeks of January and February in Trenton, with the Passage Theater production of The Gun Show. Bob Brown, from the Princeton Packet, had this to say: "At a time when many on the far left and far right claim to have the answers, Ms. Lewis’ play raises essential questions. Her play is a unique and gripping experience, masterfully directed by Damon Bonetti and thrillingly performed by Trent Blanton. See it and have your head turned around. Then tell your own gun story." Thank you to artistic director June Ballinger for bringing the play to her theater, and for putting me up for most of the time I was in New Jersey! (Thanks to Ian August and Matt Campbell, who put me up for the rest of the time I was in New Jersey. I think I still have a pair of your socks from when I forgot most of my clothes in June's dryer...) The production was nominated for the Virginia Brown Martin Philadelphia Award, which acknowledges a production that demonstrates the ability of theatre to illuminate the ways we live and interact with others as we seek to build community. 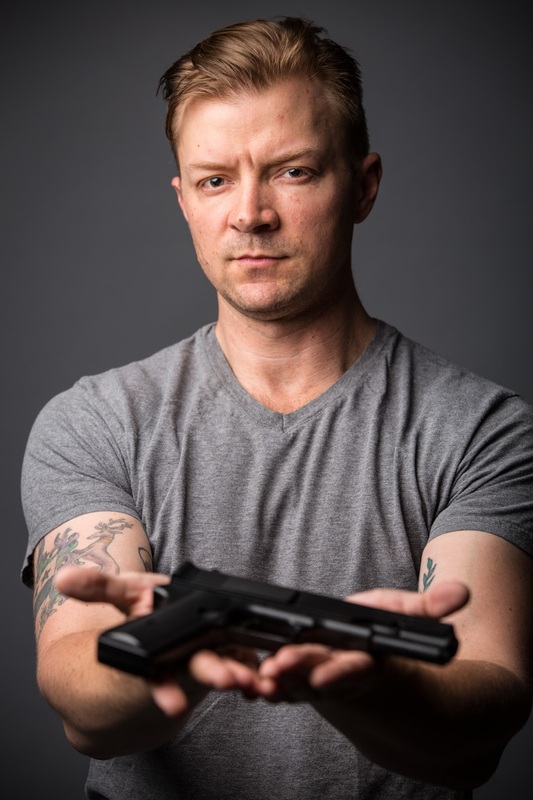 Josh Campbell included an excerpt from The Gun Show in a Protect MN Benefit in Minneapolis. Cherry & Spoon reviewed the event: "EM Lewis is one of those people who is in the middle - she grew up with guns in rural Oregon... but recognizes that there needs to be some changes in the way we think about, legislate, and handle guns. The play is funny, honest, and thought-provoking." by EM Lewis at Impact Theater in Berkeley, CA. Artistic Director Melissa Hillman helmed the fall production of The Gun Show at Impact Theater in Berkeley. Sam Hurwitt, with the Mercury News, said, "Peter Townley gives a gripping performance as the voice of the author, beautifully capturing the gravity and humor, the sweetness and horror of the story... Less than an hour long, it's a show that can't help but push some buttons and get people talking about things they disagree with or aspects they hadn't considered. That's the power of a narrative so emotionally intense and so personal: It helps put you in the shoes of people you might not have thought you'd identify with at all." The year is ending with another production of The Gun Show (the show's fifth in less than two years), in the Tucson Solo Theater Festival, which my friend and colleague Monica Bauer is producing. Maria Franco Caprile directs, and Clark Andreas Ray performs. I'm in discussions regarding three more potential productions of The Gun Show across the country -- so stay tuned for the continuing adventures of this very small and very personal piece of my heart. 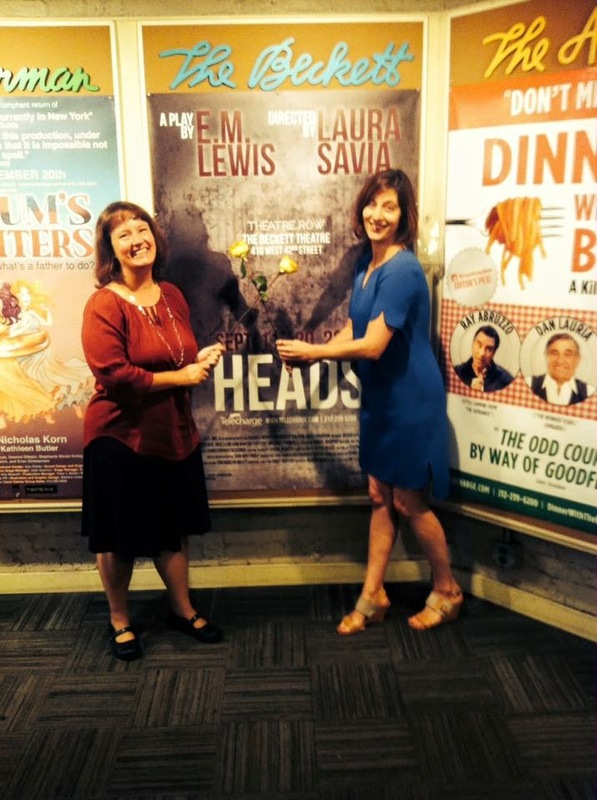 Heads had two productions this year. Both in New York City! In January, Lewis Gould directed a beautiful production at Theater for the New City. It featured my friend Robert Jordan, Carol Jacobanis, Gabriel Gutierrez, and Seamus Maynard. 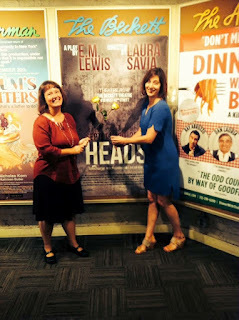 Heads at the Beckett Theater on Theater Row in New York City 2015. Playwright EM Lewis and director Laura Savia! 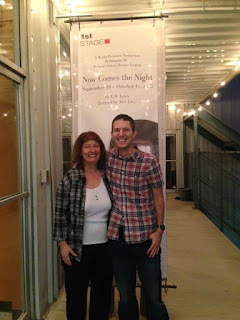 In September, just as I was gearing up for the world premiere of Now Comes the Night in DC, I was able to see the second production -- produced by Sacred Heart University at the Beckett Theater on Theater Row. Broadway producer Jerry Goehring, the creator and Artistic Director of the Theatre Arts Program at SHU, selected my play. My friend Laura Savia directed, and our actors were David Dotterer, Kim Martin-Cotton, Jose Leon, and Michael Turner. The production allowed students at Sacred Heart University majoring in Theatre Arts to take part in all creative and technical areas, and to work with a professional director on staging the show in an Off-Broadway venue. Students took on all production positions including design, stage management, assistant direction, running crew, house crew, graphics, marketing, and social media. Kevin Christopher Fox directed a production of my play True Story at the Theater School at DePaul University this fall. I so wish I could have seen it! I love this noir-ish, twisty little thriller. This was the play's second production. Infinite Black Suitcase was one of my very first full-length plays. With a cast of fifteen (!!! ), you would think that NOBODY would ever do it! But after its initial productions at Moving Arts and TheSpyAnts in Los Angeles, it was published by Samuel French and has been finding a happy home at colleges and high schools across the country ever since. It's kind of a rural Oregon Our Town, in a way -- about several families dealing with love and loss over the course of a single day. 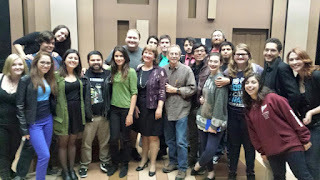 at Glendale College with playwright EM Lewis in 2015. I was delighted when my friend and colleague Jeanette Farr-Harkins brought me to Glendale College for their production of the play. 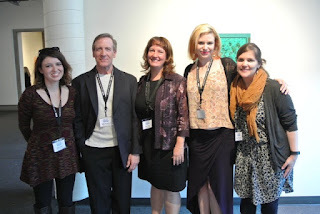 It was a joy to meet director Ed Douglas and his cast and crew. I had the most wonderful conversation with the students and audience after the show. The play also had productions this year at St. Louis Park High School in Minnesota, Marcus High School in Texas, and Lone Star College in Texas. Song of Extinction had a production at Totah Theater in Farmington, New Mexico this year. I wasn't able to see it, but read a delightful article in the local newspaper about how the producers found the actor who portrayed my character Khim Phan. I am so glad that this play is continuing to find good homes! Song of Extinction also had a reading with Theatre 33 at Willamette University in Salem, Oregon. Willamette is where I earned my Bachelors Degree, and my old theater professor Christopher Harris directed my reading. What a joy! Coming home again. In theater, the end is just the beginning; now, the real work begins as I try to find a good home for this behemoth of mine. But it feels quite wonderful to have birthed it, and to now enjoy the process of encouraging it up into its final form on a stage somewhere. One bit of surprising support for the play has come already! It received Honorable Mention on this year's Kilroy List, of the plays by women that theater folk most want to see produced. for the 2015 Climate Change Theater Action. 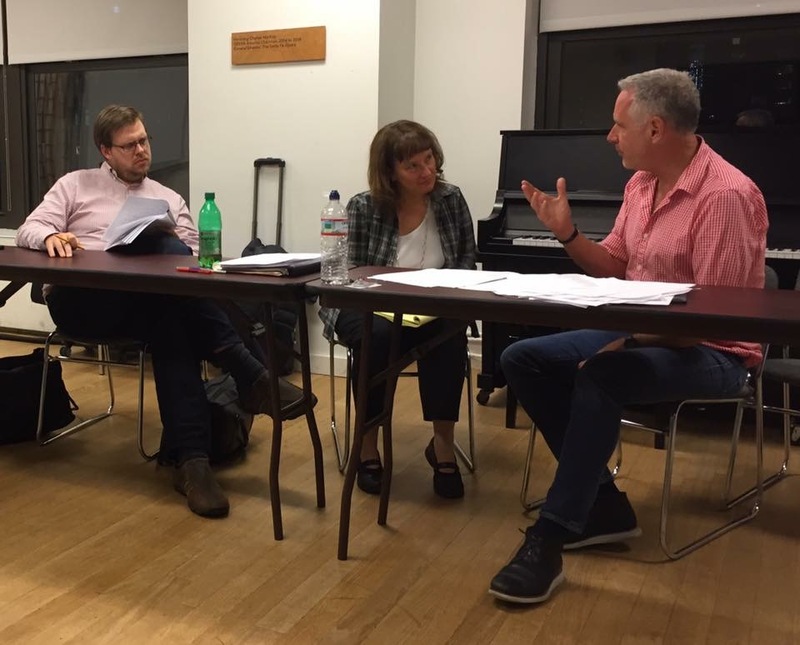 Composer Evan Meier, librettist EM Lewis, and mentor Mark Campbell, workshopping Sherlock Holmes and the Case of the Fallen Giant with American Lyric Theater. Two years ago, I was accepted into American Lyric Theater's Composer Librettist Development Program. This rigorous year-long course, taught by working professionals, helps composers and librettists learn how to work together to create a new opera. Artistic Director Larry Edelson has created an amazing program, and I will be forever grateful to him for letting me into it, and then allowing me to continue in the program for a second year. He has been supporting and encouraging my composer partner, Evan Meier, and I as we develop our first full-length opera. In the spring, we had a residency in New York, where we developed our idea for a family-friendly piece that would mash up the mystery and fairy tale worlds alongside our colleagues in the program. During the summer, I wrote an 88-page libretto entitled Sherlock Holmes and the Case of the Fallen Giant! 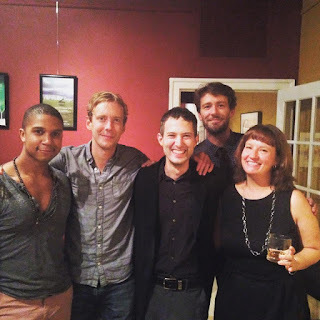 In the fall, Evan and I had another residency, where we workshopped the libretto with a great group of singers and two of our mentor/teachers -- Mark Campbell and Cori Ellison. We're hoping to be ready for a piano-vocal workshop in the fall. I met composer Clarice Assad in American Lyric Theater's Composer Librettist Development Program. Over the summer, she and I worked on an opera piece inspired by real historical events for Arizona Opera Company's "Arizona Bold!" program. We were semi-finalists with The Crossing, which dramatized the building of the Roosevelt Dam through letters between a local developer and President Theodore Roosevelt. Acquired an agent! -- So glad to be represented by Samara Harris Anderson at Robert A. Freedman Dramatic Agency! 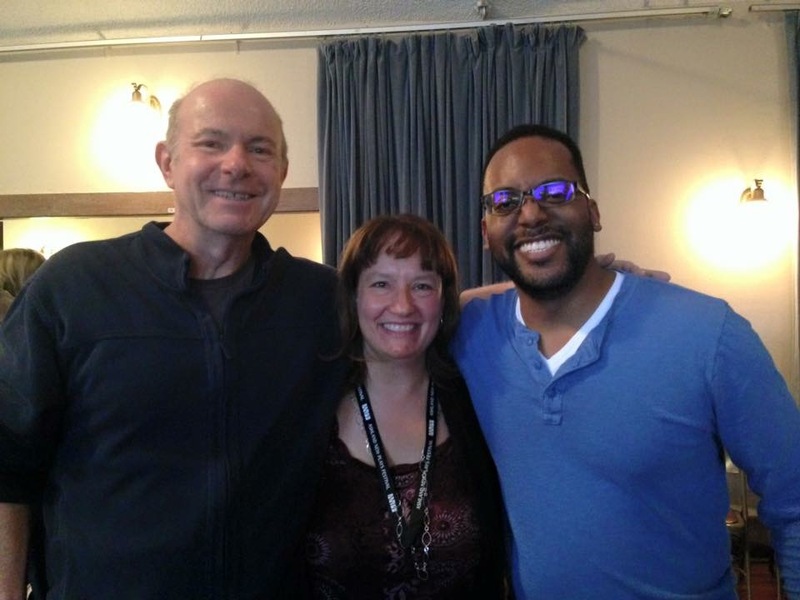 Ashland New Plays Festival 2015 - JP, EM, and Artistic Director Kyle Haden. 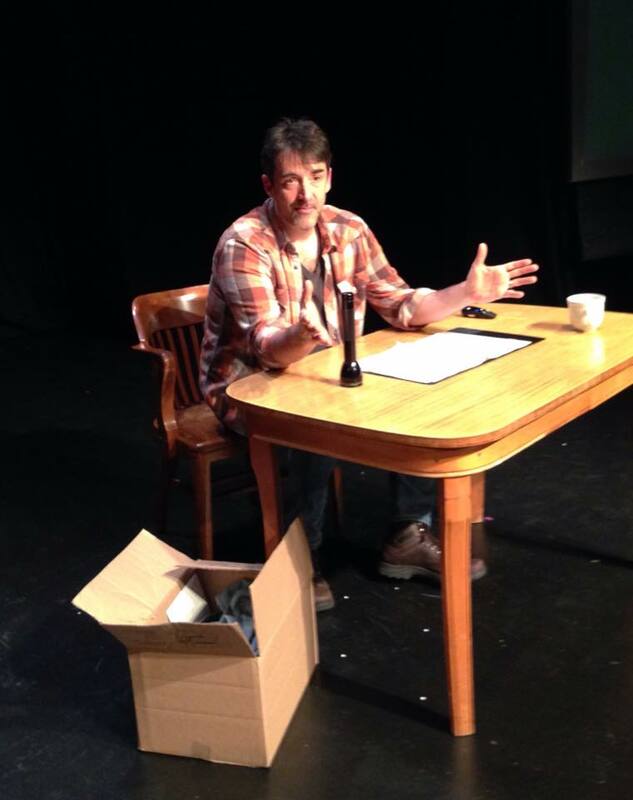 Worked as host playwright for the Ashland New Plays Festival -- Our inspiring new artistic director, Kyle Haden, led this year's ANPF. It was my sixth year as host playwright! 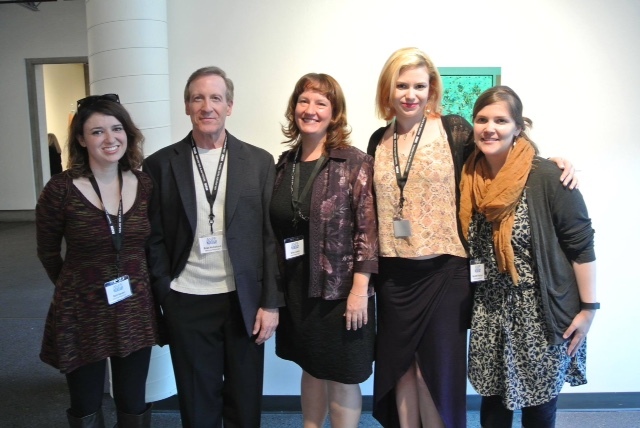 We had a fantastic bunch of plays by Meridith Friedman, Beth Kander, Skye Robinson Hillis, and Brian Mulholland. 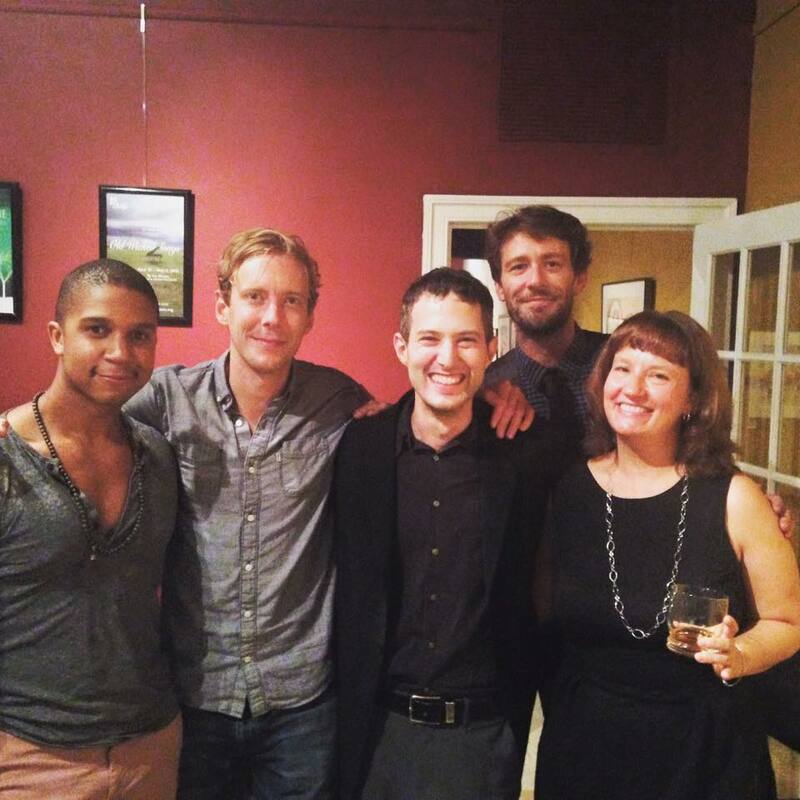 ANPF 2015 - winning playwrights! Responded to plays in the KCACTF Region 7 Festival and taught a workshop -- This was my second time responding to plays for one of the Kennedy Center American College Theater Festival's regional events. This one was held in Ellensburg, Washington. I gave young playwrights feedback on their full-length, one-act, and ten-minute plays, and taught a workshop on "Writing History" to a room full of eager young writers. Great fun! 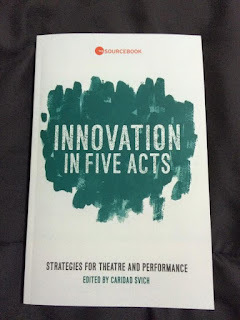 An essay I wrote about life, The Gun Show, and everything was included in an anthology called "Innovation in Five Acts." Edited by Caridad Svich, and published by Theater Communications Group. 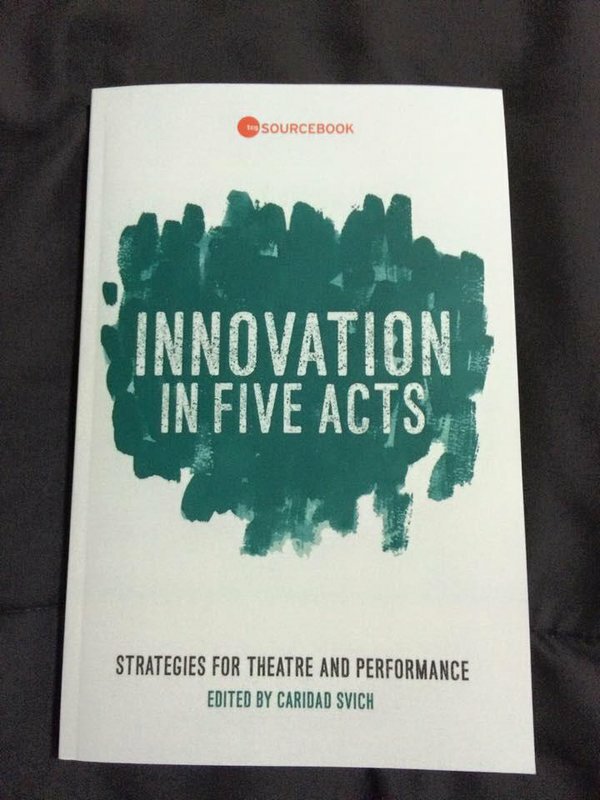 "In this edited collection, more than forty practitioners and scholars voice their whimsical, fiery, deeply impassioned, political, funny, sometimes elegiac and stinging words prompted by a call to write about 'artistic innovation.' With intelligence, thoughtfulness, rigor and wit, author after author offer their considered take on the subject, unlocking new perspectives, unearthing old ones, and in general, doing what artists do best when they are walking on ground they trust and among colleagues who are not sitting before them in continual and sometimes stultifying judgment--and that is, open our eyes, hearts and minds again." Desa Philadelphia wrote a profile of me for the USC News Magazine. Thanks, Desa! Donna Hoke interviewed me for her "PLONY" series -- all about playwrights living outside New York. Thanks, Donna! 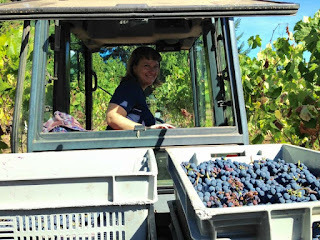 Playwright EM Lewis driving tractor and picking grapes on the farm in Oregon. Got reading glasses. 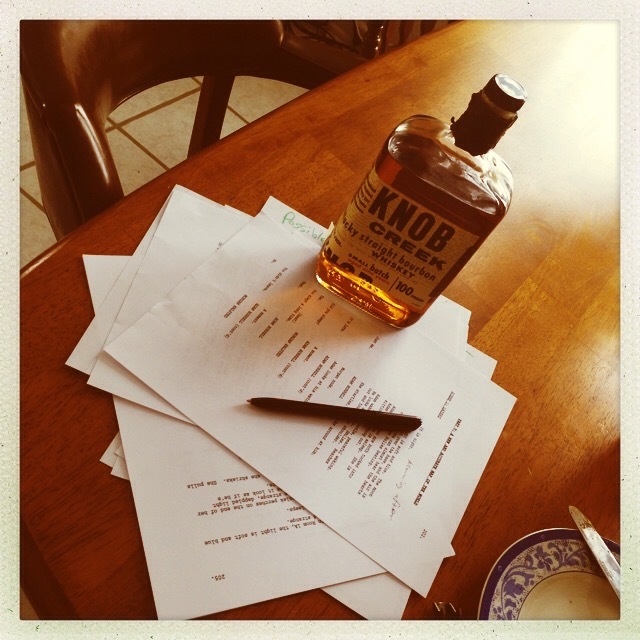 Started writing a new play. Saw Hamilton at the Public before it transferred! 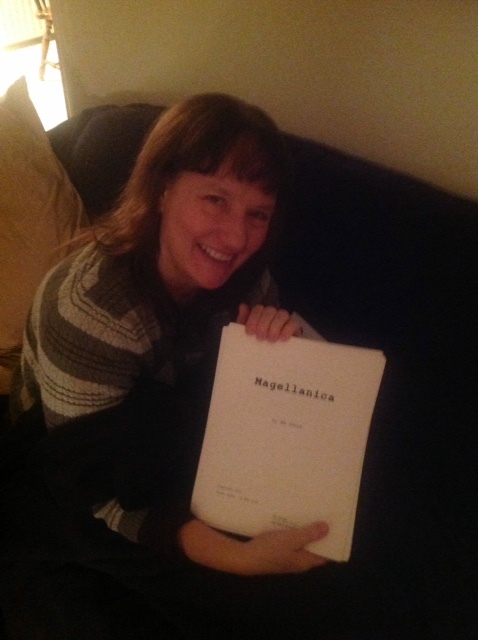 Started adapting one of my plays into a screenplay for an independent film production. Had a fling/felt ridiculously heartbroken when it ended. Picked myself up again. 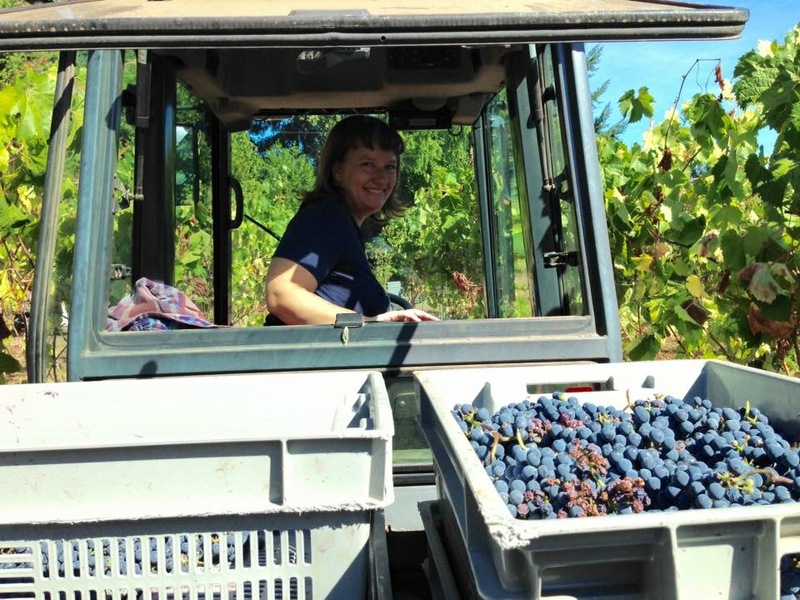 Picked grapes. Visited friends. Planted and tended and cooked from a fantastic garden. Spent time with my family here on the farm. A little bit, anyway. It's been a roller coaster of a year. I've worked harder than ever. I wrote a ton. I had a dozen productions of my full-length plays, including a world premiere. I wrote my first opera libretto. I taught a bit. I travelled almost constantly, and slept in a bunch of people's guest rooms as I made theater across the country. I am lucky, people. Who gets to do this??? It's a wonderful life, indeed.